Hansen, and Hansen is thankful to have Patterson’s roof over her head. “She is part of my family, absolutely,” Patterson, 81, a township resident for more than 50 years, said Thursday hours before the two shared their Thanksgiving meal. He said Hansen now has a house to live in and he was fortunate to make enough money to own a home. “She does what she wants, comes and goes as she wants,” said Patterson, adding Hansen also helps out with the cooking, cleaning and feeding his birds. He said Hansen provides him with company, someone in the house to talk to. “I’m thankful it’s lasted this long,” Hansen said. Patterson has 10 parrots in his home and Hansen has a cat name Babe, but unlike the portrayal in some cartoons, everyone peacefully co-exists. For the past four years Patterson and Hansen have lived in his home, an arrangement facilitated by HomeSharing Inc., a Bridgewater-based nonprofit organization which is the only one in New Jersey aimed at preventing homelessness full time through home sharing. The agency, which operates in Somerset, Hunterdon, Middlesex, Morris, Union and parts of Essex and Passaic counties, serves the working poor who are not eligible for other social services, allows seniors to remain independent in their homes and eases the burden of caregivers. The program offers affordable housing solutions to medically, emotionally and financially vulnerable individuals. HomeSharing matches “providers,” who are residents needing to share their homes or apartments in order to remain in them with “seekers” who are people searching for affordable housing in the community. Since its inception in 1984, HomeSharing has served 21,000 people and has 1,700 matches, according to Lisa Blum, executive director, HomeSharing Inc.
Blum said most matches do work because of the screening process. Several choices are offered before a match is made and mediation is provided to iron out any problems..
A widower, Patterson got involved with the agency because his daughter who lives in Nebraska was concerned about him living alone, and Hansen, 63, had a change in her personal relationship and could no longer afford her home. A social worker interviewed each of them and conducted a home visit before pairing them up. At that time Hansen had more than one cat and Patterson had parrots and a dog. 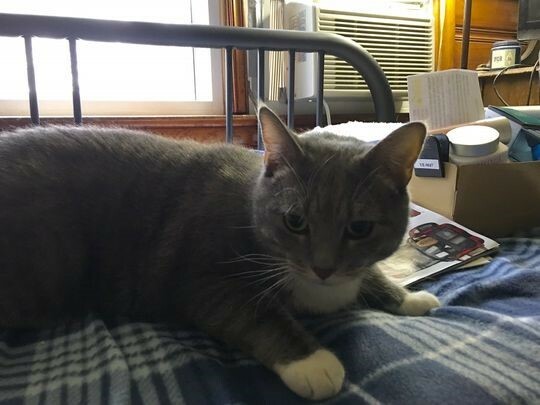 Hansen now has one cat and Patterson’s dog died. 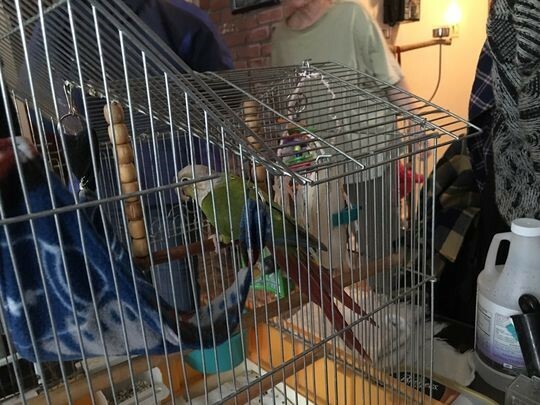 “She came with a cat and I have a house full of parrots,” said Patterson, adding the cat now walk among the birds..
“We were worried about the cats and the birds getting along,” said Blum. Hansen said her boss saw her crying one day and asked what had happened and she told her boss that her relationship had ended and she lost everything, including her animals. Her boss found HomeSharing, gave her the telephone number and told her to call. Blum said a match between Patterson and Hansen was made quickly. After the two met Patterson helped arrange to have Hansen’s belongings, including her many books, moved to his home. “What we do is find out what their needs are, their interest, and what they like, do criminal background checks, reference checks and talk to people not related to them, friends, co-workers, ex-bosses, neighbors, etc., said Blum adding that under the program each person looking to share a home has to have their own bedroom, while common areas, like living rooms and kitchens, are shared. Under the program the rents are considered affordable. Patterson and Hansen, however have a service arrangement with Hansen offering security in the event Patterson has any health issues. Hansen pays $10 a month in rent for use of the television, Patterson said. Blum said the average monthly rent is $650. A shared living agreement outlines the rent, services provided and who does what in the home, including whether meals are eaten together, who cleans, who cooks, if the toothpaste cap is left on or off and of course whether the toilet seat goes up or stays down. “We do have our arguments,” Patterson said. Hansen said they have also been able to talk out their disagreements. Their arrangement has worked so well that if anything were to happen to Patterson, Hansen would be allowed to remain in the home until it is sold, he said. “That reassures me extra time too,” Hansen said. As part of the match process, follow up visits are conducted one month, three months, six months and nine months and a year after the match is made, as well as any other time issues come up, such as if one persons loses their job and now needs other income sources. HomeSharing provides holiday food and gift packages to clients. A friend Liz Zarillo of Monroe, whose husband did Revolutionary War reenactments with Patterson, stopped by Thursday to bring him homemade pumpkin pie for dessert. Patterson also has friends who stop by to clean out the bird cages. Patterson, a great-grandfather whose only New Jersey relative is a sister-in-law, has trouble sleeping and walking and uses oxygen to help him breathe. 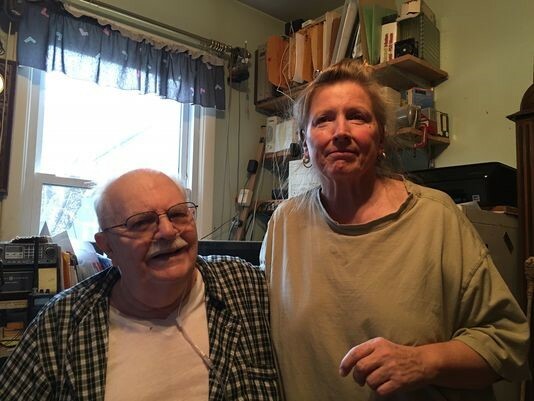 His wife died about five years ago and although as an amateur ham radio operator he talks to people all over the country, he shouldn’t live alone. Patterson is a former sergeant in the Milltown Police Reserves, former member of the East Brunswick Rescue Squad, volunteer with the East Brunswick Fire Department, former scout master, former master mason, and state hunter education instructor who over the years held many different jobs including working at a mill, gas station and drug store. His last job was in maintenance at Rutgers University. His late wife, Elizabeth, was a registered nurse, he said. Patterson said he’s most thankful for life. Additional information about HomeSharing can be obtained at the website HomeSharing.org. As part of Giving Tuesday, a global day of giving promoted on social media and celebrated the Tuesday after Thanksgiving, donations are being accepted by HomeSharing Inc. to allow the organization to help more people, Blum said. Donation information also is available at HomeSharing.org.